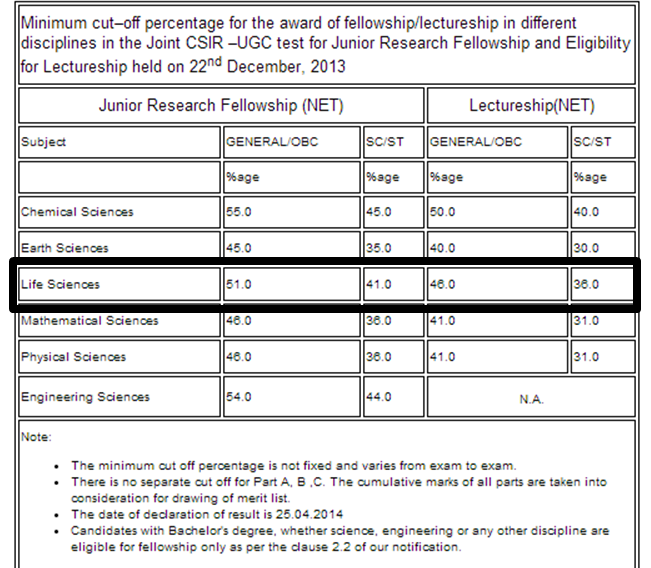 The cutoff percentage for CSIR UGC NET JRF life sciences for the year 2013 was 51%. I just want to stress the point that whatever you learn, learn deep as each question will take you many miles towards your dream of qualifying this exam. If you are expecting a question from geological time scale, I know you need to remember all those eras and organism groups originated during that time period. Still it is a worth as you got an answer right and you are damn sure about it. Your strategy should be " Focus on topics where you can expect questions, in depth preparation will definitely give you the result you want. It is not about the quantity or vastness of the topic you have covered, it is all about your in depth understanding in the topics you covered.